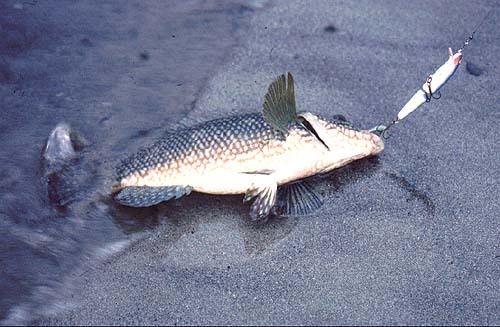 One apparent disadvantage of surface popping lures is that they probably limit the number of fish species you are likely to catch. Wrasse often take floating/diving lures. 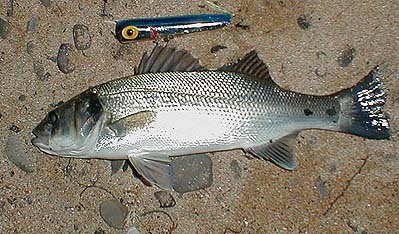 Jointed (or single) minnow type plugs, such as Rapalas, have been the standard bass lures on snaggy ground for almost twenty years. They can be very effective cast from the shore and simply wound in steadily just over the top of any rocks and weed. Big bass usually take the lures across the middle and are hooked on the mid-body treble. Smaller fish often grab at the tail end. Bass of all sizes seem happy to take large popping lures. At present my tactic is to sweep the rod tip far enough to cause a splash and a chug and then let the lure rest while I tighten up with a couple of turns of the reel handle.